LET’S EAT MORE ICE CREAM! Dennis selected this flavor. I have to say that I really wasn’t even sure what amaretto was. I kept picturing something like hazelnut, but apparently I was way off. It’s a booze. Oh yeah, I guess that sounds familiar. Anyway, I had no emotion when it came to trying this. Well, not any emotion, it still was ice cream. I’d have to say this was like a really good movie that you wouldn’t watch again. It was great flavor, but very forgettable. We all rated it at 4 spoons. Mmmm coffee. I like coffee. Strong black coffee with no sugar and no creamer. It tastes good and can be medicinal. Coffee fraps and shakes and Coolatos and all those fancy drinks with whipped cream are good, too. So, of course, soft-serve coffee flavor would be good too, right? Well, it was, but it wasn’t good enough to stand on its own. I think it’d be a great base. Add some Oreos or fudge to this one. Now that’s something I could get behind. Aya liked it. Kelly forgot about it. And Dennis thought it was OK. The overall rating was 3 spoons. This flavor I’ve been the most curious about. Other than watermelon Jolly Ranchers or Hubba Bubba, I rarely see watermelon-flavored things. I wasn’t expecting it to be awesome, but I was just very curious. , I felt today was the day to try it. Nobody liked it. Even I have to say it was awful. But I couldn’t stop eating it. It was like watching Saved By the Bell on a Saturday morning. You know it’s an awful show, but you just can’t seem to change the channel. 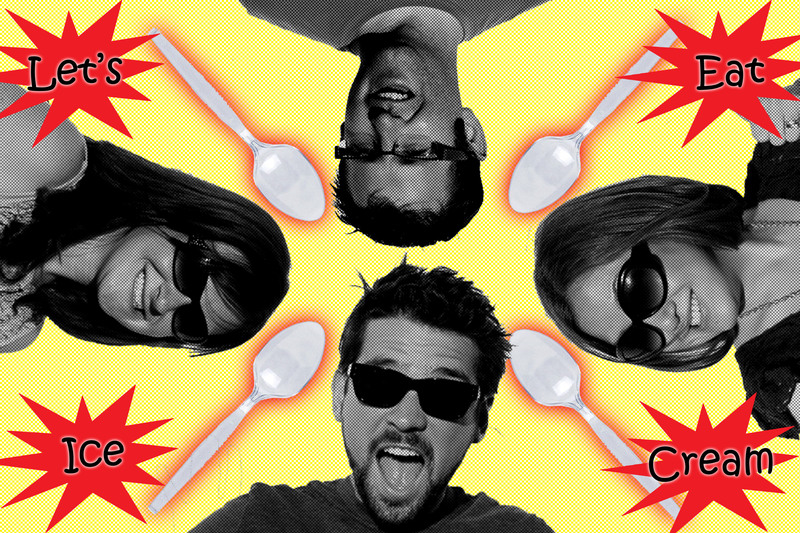 Everybody rated it 1.5 to 2 spoons, but I gave it 4 plastic spoons! So awful yet so good! I was expecting the same punch the orange had with this one. I pictured a nice apricot cobbler with melted ice cream pooled around it. A perfect blend of sugared fruit and vanilla ice cream. But to me, it tasted like vanilla ice cream after someone waved an apricot over it. It wasn’t bad, it just wasn’t enough. This could be because I tried itafter I had the watermelon. I think it needed a palette cleanser. Kelly on the other hand liked it, a lot. Enough to rate it as 4.5 plastic spoons! We all rated it at 3 spoons. Having another set of taste buds is definitely adding to the discussion of flavors. I wonder who we’ll get to join us next week? You’ll have to check back and see.